With the question of statuettes now out of the way, I should add that I’m deeply grateful for Selma. Not so much for its aesthetic achievements, mind you, as for its contribution to the historical record. Needless to say, no feature film can ever hope to be 100% accurate. In telling a story that will connect with viewers over a two-hour period, filmmakers necessarily cut corners and make mental leaps. Still, even those of us who were alive during that tumultuous era need reminding of what happened, and why it did. One key function of movies is to give us visual images that allow the past to live on. 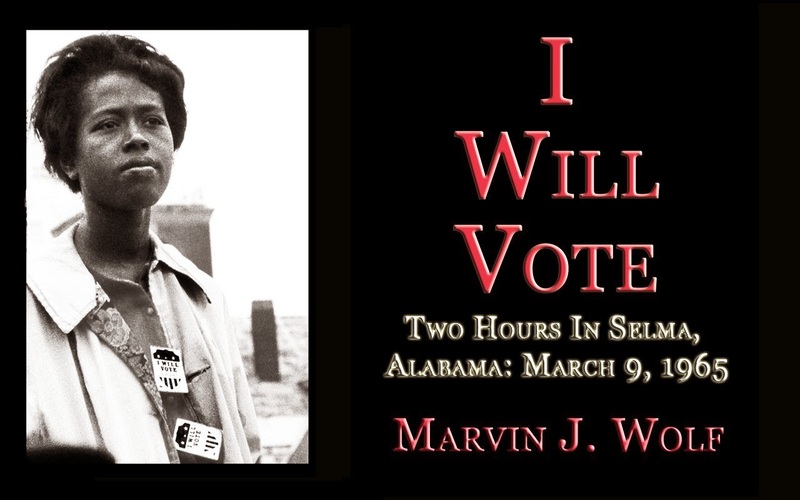 With Black History Month just wrapping up, it seems high time to salute Selma for putting before our eyes (even in a necessarily truncated form) what went down on Alabama’s Edward Pettus Bridge in March 1965. What happened fifty years ago has much to teach us about today’s racial divide, and I thank DuVernay and company for the memories. Wolf had with him only three rolls of film. (Remember film cameras?) He shot as many photos as he could, capturing the image of neatly-dressed black protesters, solemn-faced white clergy, alert news reporters, and policemen feeling the heft of their nightsticks. Wolf was particularly taken by the earnest face of a black female college student wearing a button that announced, “I will vote.” Then a rock was thrown in his direction, and a giant of a deputy in bib overalls knocked him to the ground. He prudently left town, and those three rolls of film were forgotten for almost fifty years. How fascinating to see now what he captured then. By the way, Marv has another new non-fiction book out, Abandoned In Hell, The Fight For Vietnam's Firebase Kate. Old journalists never die . . . thank goodness! To look at the Civil Rights era from another perspective, check out my colleague James McGrath Morris’s new Eye on the Struggle: Ethel Payne, the First Lady of the Black Press. It’s gotten terrific reviews, and I look forward to reading it myself. So another Oscar ceremony is in the books. I’m not unique, I’m sure, in finding my greatest satisfaction in the unexpectedly pointed remarks of many of the winners, as they received their statuettes for films that touched (however lightly) on serious matters. There was Patricia Arquette’s shout-out in favor of equal pay for women, which elicited Meryl Streep’s enthusiastic “You go, girl!” There was Eddie Redmayne, honored for playing Stephen Hawking, symbolically giving his award to Amyotrophic Lateral Sclerosis sufferers (though he made clear the Oscar would live at his house). Soon afterward, winner Julianne Moore was equally eloquent about the need to find a cure for Alzheimer’s disease. Triple-winner Alejandro González Iñarritu needled the audience about immigration issues, and the writers of “Glory” (the Oscar-winning song from Selma) both sang and spoke so powerfully about civil rights that it was no surprise to see Academy members with tears rolling down their cheeks. As always, a memorable (though somber) part of the evening was dedicated to those Hollywood figures who had passed away since last year’s ceremony. The painter who’d provided portraits of the deceased beautifully captured the exuberance of Geoffrey Holder, the husband of my very first dance teacher. And I was moved to see recognition for others I’d interviewed over the years: cinematographer Gordon Willis, screenwriter Lorenzo Semple Jr., and particularly Charles Champlin, veteran film critic of the Los Angeles Times. 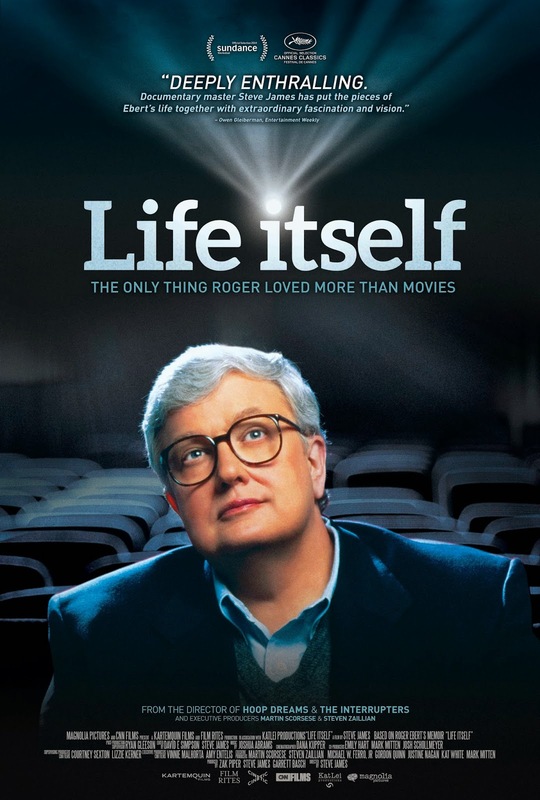 Hollywood generally doesn’t love movie critics (though Life Itself, a documentary feature about the life and career of the late Roger Ebert, was short-listed for one of this year’s nominations.) But the film industry had a rare affection for Charles Champlin, who was considered both knowledgeable and fair-minded. By the time I interviewed Champlin in 2008, he was long retired and suffering from health issues. When I asked about the films of the Sixties, he simply didn’t remember certain matters on which he had once boldly taken a stand. I came home with one of his books, The Movies Grow Up: 1940-1980, which begins by explaining that “my generation grew up with the movies and without television. The movies entertained us, inspired us, consoled us, shaped us profoundly; taught us (although not invariably wisely or well) and attempted to spare us from some bitter truths about the world.” By the time I met Champlin, though, he was thinking less about movies than about, well, life itself: “The world slips away from us very fast, I think. It’s like sand through your fingers. You think you’ve got it all in your hand, but it’s gone through your fingers.” Rest in peace, Chuck. Coming soon: on Saturday, May 2, 2915, I'll be on a panel discussing "The Secrets of Interviewing Famous People." It's part of the American Society of Journalists and Authors annual three-day conference in New York City. Click here for more info. Though Forster freely admits he’s not going to be People Magazine’s next Sexiest Man Alive, he’s hardly finished with his acting career. He may be over seventy, but interesting character parts keep coming his way. There was a time, however, when he seemed to be scraping bottom. 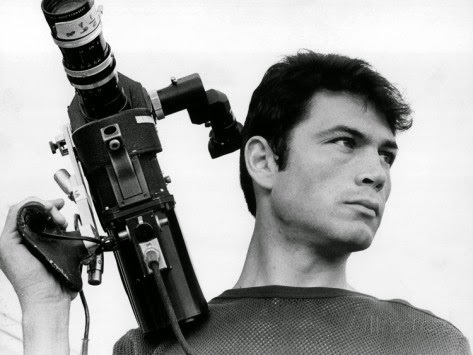 Back in 1967, he had made his film debut under the direction of John Huston. For five years he played important dramatic roles in acclaimed Hollywood productions like The Stalking Moon and Medium Cool. He’s philosophical about his fall from grace: “There is a constant push of new people coming in who get the attention of an agent who goes to town and tries to promote them. There’s only so many jobs, and everybody is trying to find room for their clients in those few jobs.” Still, he had a family to support, and it was tough being relegated to the occasional TV episode and Roger Corman flick. Certainly, his start as an actor was remarkably lucky. Accompanying a friend from acting class to see an agent, he ended up featured in a Broadway play. And suddenly John Huston was asking to meet with him for an important dramatic role in Reflections of a Golden Eye, starring Elizabeth Taylor and Marlon Brando. Forster admitted to Huston, “I never made a movie, I don’t know how they’re made, I don’t know what the tricks are, but if you hire me I’ll give you your money’s worth.” Next thing he knew, he was in Rome, riding naked on a big white horse. After a weekend that’s been . . . uh . . . dominated by Fifty Shades of Grey, I can’t resist submitting a Valentine to my many namesakes, the Beverly Grays of the world. When my mother married my father, she was delighted by the simplicity of her new last name. My given name, Beverly, honors some long-lost relatives, but I suspect it also reminded my parents of Southern California’s glamour locations: Beverly Hills, Beverly Glen, Beverly Boulevard. Just by happenstance, we ended up in a subdivision called Beverlywood. 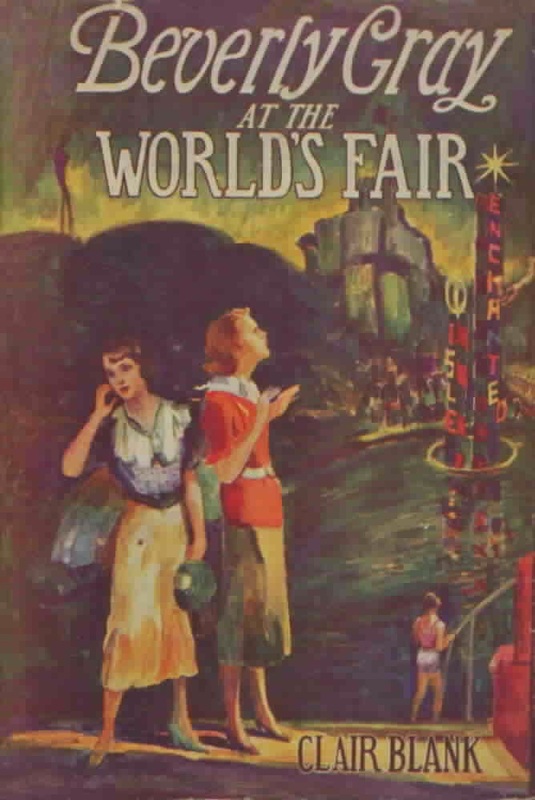 And one day, when I was still tiny, my parents were surprised to spot a young-adult novel titled Beverly Gray’s First Romance. It turns out there were 26 entries in the Beverly Gray Mystery series, published by Clair Blank between 1934 and 1955. Beverly was a beautiful (of course) red-headed reporter -- someone on the order of Nancy Drew, though slightly older -- who solved mysteries and tracked down criminals all over the world. As a budding journalist myself, I enjoyed scouting out these volumes, which today are considered collectors’ items. It’s slightly embarrassing to me now that if you do a Google search on my name, most of the references are to my literary alter-ego. But the Internet shows me there are living Beverly Grays too, along with a number of dead ones. (I’ve stumbled across several obits.) 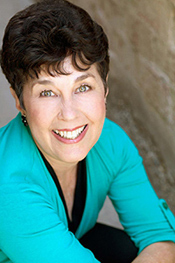 Some are writers, among them the Beverly Ann Gray who has written a number of scholarly books about present-day Africa, like The Nigerian Petroleum Industry, A Guide. I’ve also discovered, via Amazon, a Beverly C. Gray who keeps churning out volumes in the Black Knights of the Hudson series, and another Beverly Gray (definitely not me) who has published The Boreal Herbal: Wild Food and Medicine Plants of the North. The Beverly Gray who wrote and marketed sentimental verse seems to have disappeared from view. But I often see references to a Beverly Gray who’s respected as the coordinator of the Southern Region Ohio Underground Railroad Association, headquartered in Chillicothe, Ohio. I once got a friendly email from a Beverly Gray in Florida. Presumably she’s not the Beverly Gray who was arrested in that state on April 23, 2014. (I have a link to her mugshot.) I’m pleased there’s a Dr. Beverly Gray who’s an obstetrician in Raleigh, North Carolina, but I don’t know how I feel about the Beverly Gray who’s married (according to Twitter) to an “Awesome Man of God.” One Beverly Gray is a cello teacher in Scotland, while another is a prize-winning equestrienne in Utah. Facebook tells me that Beverly Grays go to church, like the Atlanta Center for Cosmetic Dentistry, groove to Willie Nelson, work for the IRS, and are students of the University of Life. If you’re in show biz, it’s important to have a name that’s unique, which is one reason some actors shed their birth names. (Julianne Moore, for instance, was born Julie Smith, but discovered another professional actress had gotten there first.) On the Internet Movie Database, I’m happy to be the only Beverly Gray. But there’s actually a crew guy named Gray Beverley. Go figure. In the era of Fifty Shades of Grey, the romantic tales of Jane Austen must seem awfully tame. Still, I’ve been on a Pride and Prejudice kick lately, and the advent of Valentine’s Day is the perfect moment to contemplate the innocent side of romance. The time is also ripe because I’m now preparing to lead a community discussion as part my local library’s annual Santa Monica Reads program. The book this year is Longbourn, Jo Baker’s 2013 retelling of Pride and Prejudice from the perspective of the Bennet family’s servants. Longbourn, which I’d personally categorize as educated chick lit, contains some of the upstairs/downstairs social tensions that have drawn many of us to Gosford Park, and more recently Downton Abbey. Longbourn is instructive, mildly steamy (especially when there’s laundry to be done), and presents some uplifting grand passion among the lower orders. But, truthfully, I’d prefer Pride and Prejudice any day. Hollywood has always been fond of the romantic sparring between the proud Mr. Darcy and the spirited Elizabeth Bennet, who thinks the worst of him from the moment he arrives in her little village and sneers at the locals. I have a strong affection for the Golden Age version, directed by Robert Z. Leonard, in which Laurence Olivier and Greer Garson play the lovers, and Edmund Gwenn (best known for portraying Santa Claus in the original Miracle on 34th Street) is Lizzy’s properly whimsical father.Yes, I must admit that Garson, though completely charming, is much too old to play Elizabeth. In 1940, when this film was released, she was 36, though Austen’s character admits in passing that she’s not yet one-and-twenty. But Olivier makes the perfect Darcy, and Edna May Oliver is hilariously obnoxious as the stuffy Lady Catherine de Bourgh, whose outspoken disapproval of the match ironically ends up furthering it. It took over sixty years for another big-screen version to surface. The Elizabeth of Joe Wright’s 2005 version was aptly played by the dewy yet spunky twenty-year-old Keira Knightley, with Matthew McFadyen as her Darcy. Who better than Judi Dench in the Lady Catherine role? Others involved included Donald Sutherland and Brenda Blethyn as Lizzy’s mismatched parents. I was amused to discover that her angelic sister Jane was played in this version by Rosamund Pike, far removed from her Amy Dunne character in Gone Girl. And Carey Mulligan, in her first film appearance, was cast as one of the lesser Bennet sisters. Knightley earned herself an Oscar nomination for this film, which was also honored for its music, art direction, and costume design. But true fans of the novel are particularly fond of 1995’s serialized BBC television version, starring Jennifer Ehle and Colin Firth. The story of Pride and Prejudice is so well loved that it has also shown up in some multicultural versions. I refer you to Bride & Prejudice, an oddball adaptation from 2004 obviously intended to capitalize on the Bollywood craze. 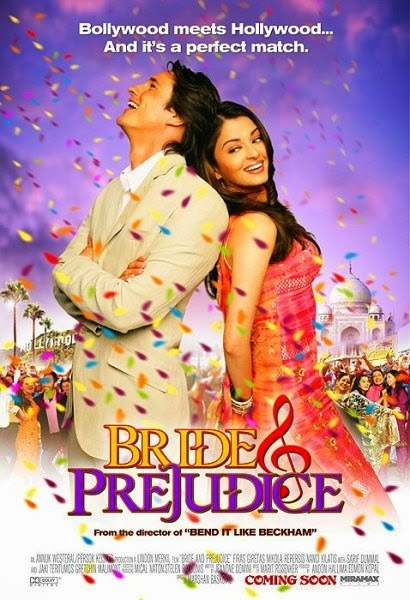 In Bride & Prejudice, Lizzy Bennet is transformed into Lalita Bakshi (played by the gorgeous Aishwarya Rai), one of five daughters in a modern-day Hindu family. Her Mr. Darcy is an American (Martin Henderson), cocky scion of a wealthy family, who shows up in her quaint Indian town with plans to build a big, bad hotel chain. The plot sticks fairly closely to Austen’s original, except that at one point the main characters are whisked away to L.A., where they sing and dance in inimitable Bollywood fashion in front of Disney Hall and other SoCal landmarks. I suspect that Jane Austen would have been puzzled, and then highly amused. The public is cordially invited to all Santa Monica Reads events. Y’all come!